When people that we care about are sick, we often feel helpless. If family or friends are in hospital we can take them small gifts , and keep them company and offer reassurance, but often we would love to be able to do more. So why not create an angel healing book to aid their journey to good health again? 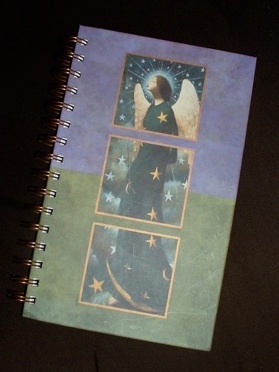 You can often buy a notebook that is already decorated with angel images or you can buy a plain version and decorate it with your own angel images. "Angels, please take care of the special people inside this book. Please surround them in angelic light and filter healing through their aura so that healing can take place, all in accordance with their highest good. With thanks (add your name here)." Each time anyone you know and care about is unwell or needs a little extra help, add them to your book. You can also write a few special words for each person (give them their own page) and include a photo.